New species of bacteria that can "eat" petroleum products have been discovered by environmental scientists at UC Riverside. Similar organisms are fictionalized in the new sf/thriller Black Monday by R. Scott Reiss. The bacteria contain previously undiscovered classes of enzymes that can break down petroleum products. It is hoped that the bacteria could be used to help with the clean-up after oil spills (bioremediation), new medical treatments, alternative energy biofuels and enhanced oil recovery. The researchers had better be careful. In his new novel Black Monday, author R. Scott Weiss writes about a terrible plague that could destroy modern civilization and kill millions of people. The plague organism does not target human beings - it attacks oil and makes it unusable, thus bringing our mechanized civilization to a halt. I highly recommend this novel. It's a great read, and it really makes you think about what will happen as we approach (and pass) peak oil - the point at which the amount of oil pumped out of the ground starts to decrease every year. The bacillus itself creates new copies of the data every time it reproduces itself. 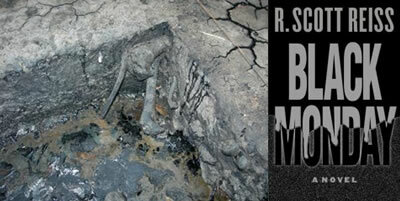 Read more about New petroleum-degrading bacteria found at Rancho La Brea Tar Pits in Los Angeles.